The Patriots will conduct their first practice of training camp later this morning and we’ll get our first look at the 2016 version of the team. The Pats signed two more players on Wednesday, guard Jon Halapio and TE Bear Pascoe bringing the roster to the 90 player limit. The team received a roster exemption for safety Nate Ebner who is with the US Olympic Rugby Team in Rio. Considering all the new blood the team brought in for the interior of the offensive line this offseason, the addition of Halapio who was a Patriots 6th round draft choice back in 2014, can’t be considered encouraging news for the short-term availability of Tre’ Jackson, Josh Kline and Shaq Mason who were missing from spring workouts due to injuries. They begin the season on the Physically Unable to Perform List (PUP). All three however, can come off of PUP at any time. Halapio was one of the final cuts of the Patriots training camp in 2014 and spent time on the Broncos practice squad and the Cardinals last summer. He also played in the Fall Experimental Football League with teams in Boston and New York. The health along the interior of the offensive line will bear some watching. Kline was arguably the Patriots best guard in 2015. Jackson started nine games and Mason 10 as rookies a year ago. All three are expected to compete for the starting guard positions this season. They’ll be battling Jonathan Cooper who came over from the Cardinals in the Chandler Jones trade as well as 3rd round draft pick Joe Thuney. Pascoe the 8th-year TE that played for three games a year ago with Detroit will be trying to win the job as the Patriots third tight end. Clay Harbor begins camp on the PUP list. Pascoe was originally drafted by the 49ers in 2009 and has spent time with the Giants, Falcons and the Bears before landing with the Lions in 2015. He has 40 career catches for 336 yards and two touchdowns. The 6’5, 257-pound veteran is known primarily as a blocking tight end. Check out our earlier primers on the running backs, wide receivers, tight ends, offensive line, defensive line, linebackers, cornerbacks and the safeties. 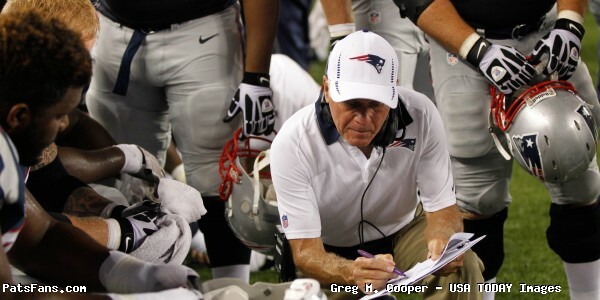 And be sure to keep tuned into PatsFans.com during training camp as we’ll post daily updates from down in Gillette. This entry was posted in Patriots Commentary, Patriots News and tagged 2016 NFL Draft, 2016 Patriots Roster, 53 Man Roster Projection, Bear Pascoe, Bill Belichick, Jon Halapio, New England Patriots, NFL, Patriots, Patriots 90 man roster, Rob Gronkowski, Tom Brady on July 28, 2016 by Steve Balestrieri. The Patriots headed into training camp this morning. The veterans had to report in and join the rookies who have been at it since Sunday. Now the dog days of summer begin as the team begins to come together on the field and the competition begins in earnest for roster spots in 2016. Here are four things that you need to be watching for. It can be a daunting task, with 90 players running around on two separate practice fields, it can be a blur at times. While most fans that make the trek down to Gillette watch Brady and the wide receivers do their thing, there are lots of other activities going on that will also bear watching very closely this year. So let’s start with the elephant in the room. How Will the Reps Break Out Between Brady and Garoppolo? Normally this one is a no-brainer. Brady loves the work, the competition and tries to protect his snaps like a miser would a pile of gold dust. But with #12’s suspension, this year the coaches face an intriguing dilemma. How will the QB reps with the 1st team offense play itself out? There is no more “if” Brady is suspended. It’s happening and he’s going to sit the first month of the season. Now Jimmy Garoppolo is no longer facing a possible scenario where he may be forced to play the first quarter of the season, he is. Bill Belichick and Josh McDaniel will have to walk a fine line here. 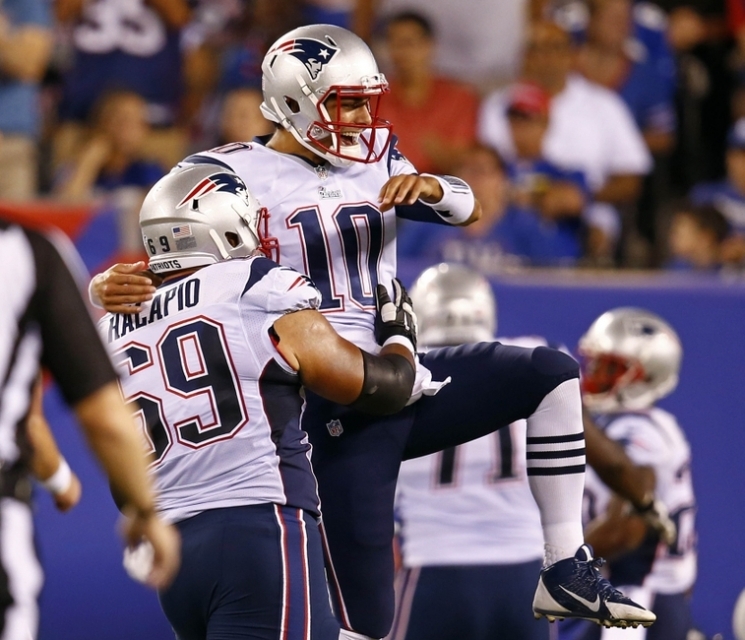 Garoppolo must be prepared to take the field on September 11 against the Cardinals and run the offense smoothly. 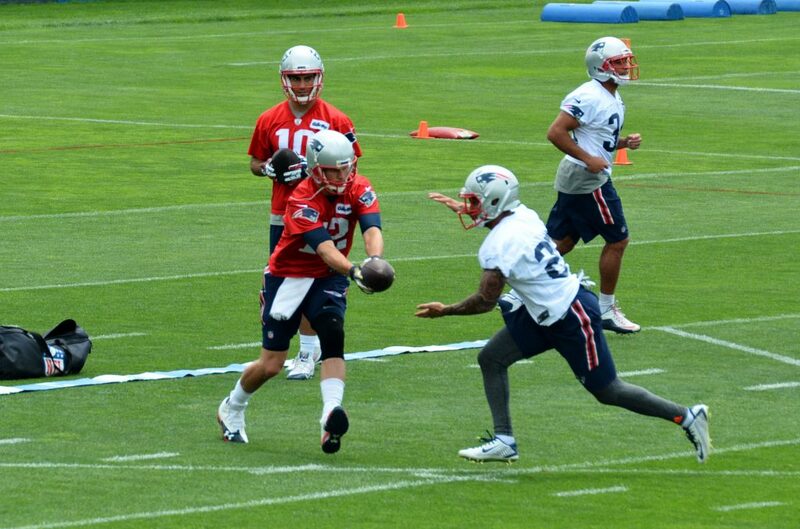 Brady, on the other hand, has a lot of new weapons in the arsenal that he has to get comfortable with. Martellus Bennett, Chris Hogan, Malcolm Mitchell are all new faces who will be counted upon in 2016. And Brady WILL be the starting QB from Weeks 5 to 17 and beyond once the playoffs begin. Brady can’t just skip training camp, then the first month of the season and be expected to be sharp against the Browns in Week 5. And Jimmy G. will also need time to work in a comfort level with the same players. There is no right or wrong answer here. The coaches will have to find a happy medium. I would expect Brady to get just a hair over the 50 percent mark in practice with Jimmy G, getting the lion’s share of preseason game work. Who Steps Up at Running Back? This was one of those positions we thought the team would address this offseason. But they mostly decided to stand pat. The only additions were veteran Donald Brown and UDFA D.J. Foster. As a result, this position is truly wide open. 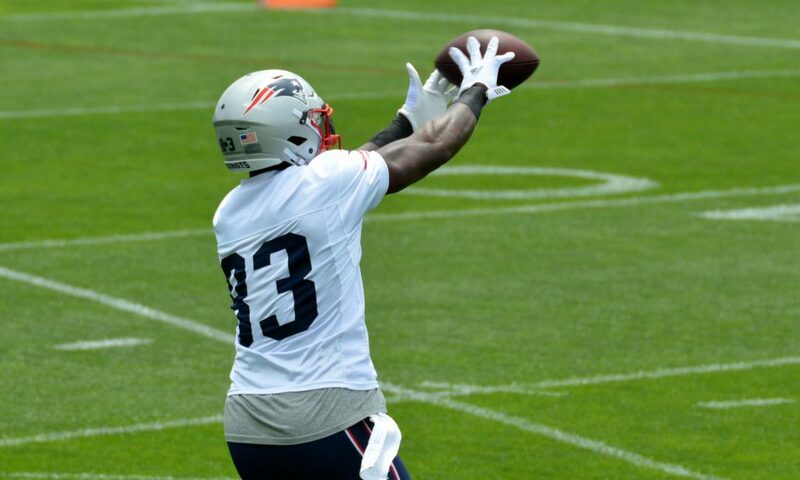 With Dion Lewis coming off of an ACL injury in November and beginning camp on PUP, coupled with LeGarrette Blount coming off of a serious hip injury, the positions are there for the taking. Blount has been a favorite of Bill Belichick and he did have a decent season before he was injured. He’s that punisher that the team likes when they get ahead on opponents and Blount has proved that when he can get to that second level, he’s very effective. But if he can’t move effectively? The team is in a rough spot. For the big backs that can pound the ball, that would leave them with either Tyler Gaffney or Joey Iosefa. Gaffney is entering Year 3 and still hasn’t taken the field and Iosefa had one big play on his resume from a year ago. 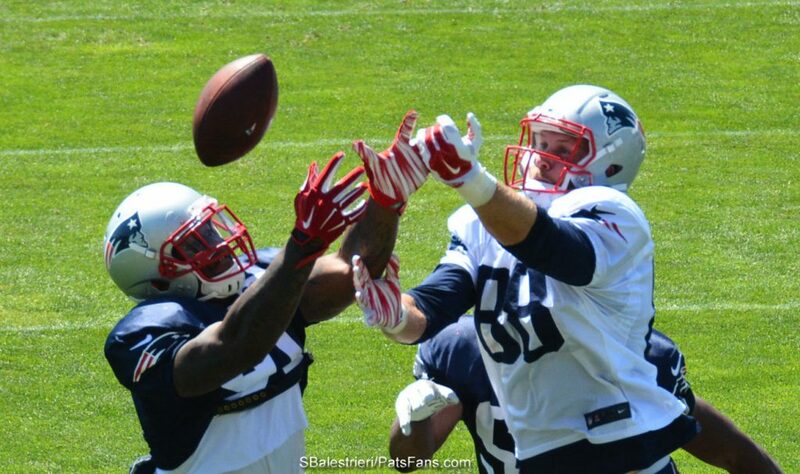 Brandon Bolden is just there for STs and as an emergency fill-in. The team will clearly err on the side of caution with Lewis which opens up camp and preseason for the third down passing back role. James White was very good out of the backfield but the team showed zero confidence in him as a runner. Donald Brown is a vet who may be getting a little long in the tooth. He can do a bit of running and is a good receiver as well as an excellent blocker. Foster is an intriguing guy who looks dynamic out of the backfield. If he can prove he can run with the ball, he’ll be the guy to watch. 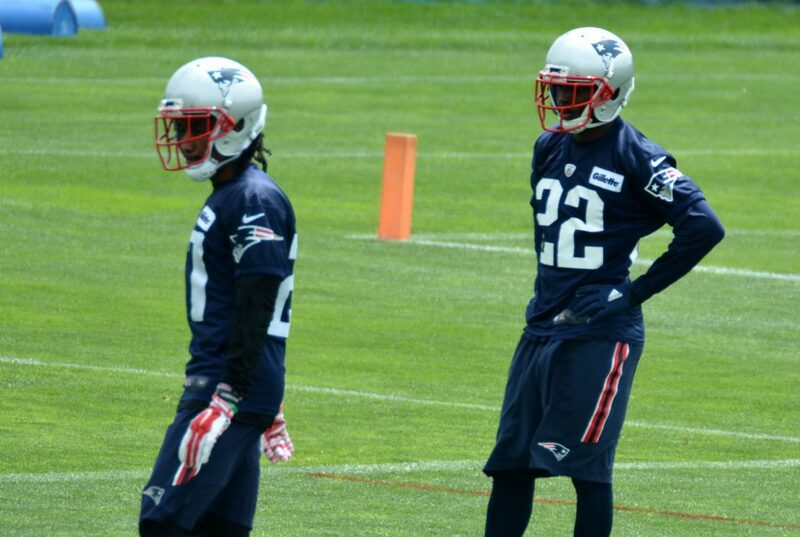 Cornerback Depth, Who’s #2 and #3? 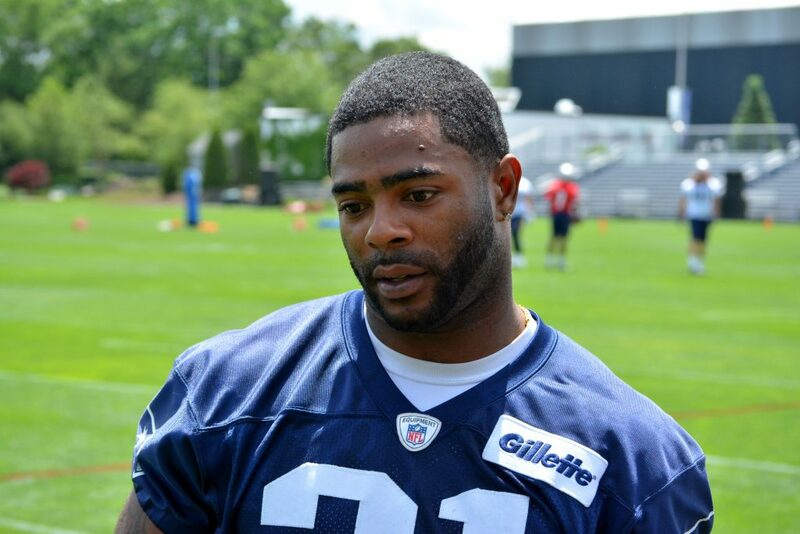 Malcolm Butler is the Patriots top cornerback. That isn’t going to change unless he gets hurt this summer. But here is where things get interesting. While both Logan Ryan and Justin Coleman return after starting as the right and slot corners respectively, competition is wide open. 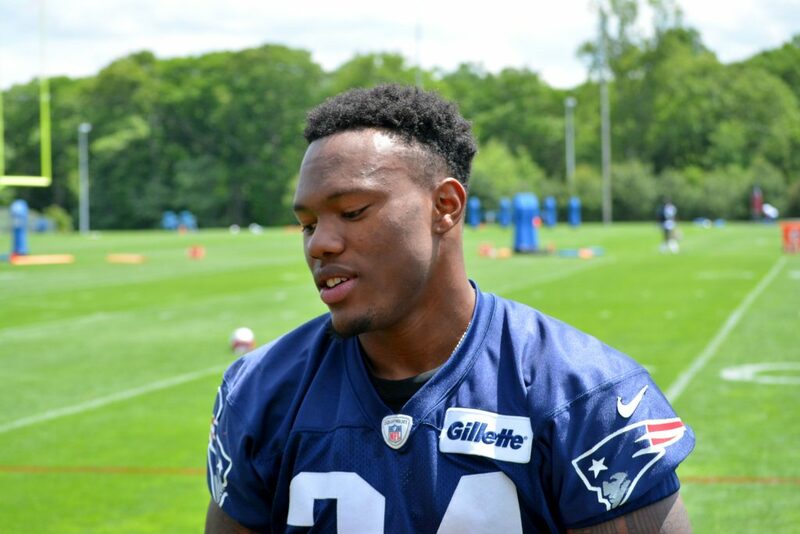 Top draft choice Cyrus Jones is going to push Coleman at a minimum for the starters job at slot corner. He may even push Ryan for the right corner spot and force him into the slot. But the competition doesn’t end there. Also competing for a roster spot is 2nd-year player Darryl Roberts, veteran E.J. Biggers and UDFAs Jonathan Jones, Cre’Von LeBlanc and V’Angelo Bentley. The young players are all on the smaller side but very athletic and have return ability. Jones and LeBlanc stood out this spring, the final slot may come down to STs ability. Roberts made an outstanding play as a gunner in minicamp, something that had to catch the coaches eye. This will be a fun position to watch this summer. While we thought the team would address tackle this spring, the team again threw us a curve and stood pat. But they added several new faces in the interior offensive line and how it plays out will bear watching. The Pats brought in former 1st round pick Jonathan Cooper in the Chandler Jones trade. Injuries and inconsistent play have marked his career to date. Now he’s looking to reignite his career under Dante Scarnecchia. The team also drafted Joe Thuney and Ted Karras. With Josh Kline, Tre’ Jackson and Shaq Mason missing the spring workouts, it opens up some intriguing possibilities inside. Most assume Bryan Stork and David Andrews are locked in a positional battle for the center job. But Thuney took some snaps there as well this spring. Health and performance on the field will be the final decision makers here but we could be conceivably looking at a completely different interior of the line in September. This entry was posted in Patriots Commentary, Patriots News and tagged 2015 NFL Season, 2016 NFL Draft, 2016 Patriots Draft, 2016 Patriots Roster, 2016 Patriots Training Camp, 53 Man Roster Projection, Bill Belichick, Julian Edelman, LaGarrette Blount, Malcolm Butler, New England Patriots, NFL, Patriots, Rob Gronkowski, Rob Ninkovich, Tom Brady on July 27, 2016 by Steve Balestrieri. The Patriots head into training camp this week and there should be no shortage of competition at a number of spots. As a lead-in to the beginning of camp, we’ll break down the positions and give our take on who is a lock, a near lock for the 53-man roster and who is on the bubble. Next up are the Safeties. So the next position to break down are the safeties. The backend of the Patriots secondary is set, starters Devin McCourty and Pat Chung return and each will turn 29 in training camp so their age isn’t an issue. Duron Harmon is normally the first man on the field, but he missed all of the spring so 2nd-year player Jordan Richards was taking the majority of his reps. Richards is shorter and stockier than Harmon and is a bit stiff for the backup center field role, he’s better suited to the box or the hybrid safety/linebacker role. Nate Ebner will not be at camp, having been granted permission to play rugby in the Olympics. Those five plus Brandon King were on last year’s roster. The team let Tavon Wilson walk in free agency but waiting in the wings is LB/S Kamu Grugier-Hill, Brock Vereen, Cedric Thompson and the recently signed Vinnie Sunseri. The team is deep and talented at safety and they’re more than addressed the loss of Wilson who played very little the past two seasons. McCourty is the quarterback of the secondary, a co-captain of the team and the glue that holds everything together on the backend. He still doesn’t get the credit he deserves for his center field play. With each passing year, he’s asserting his leadership more and more and still just 28 is one of the oldest established veterans of the unit. 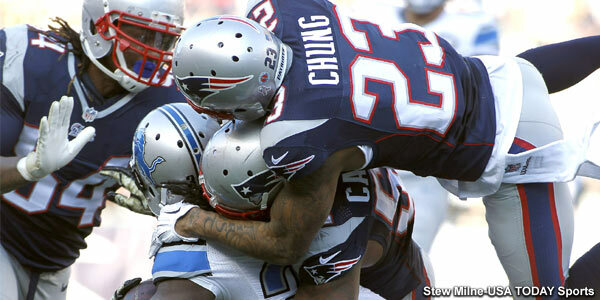 Chung continues to enjoy a renaissance in his second go-around with the team. He plays up in the box and is extremely effective at stopping the run and covering the tight ends. It seems like Chung should be older than 28, but he still has several good years left in his career. Harmon was considered a reach when he was drafted in 2013 but now he’s a very valuable member of the defense. 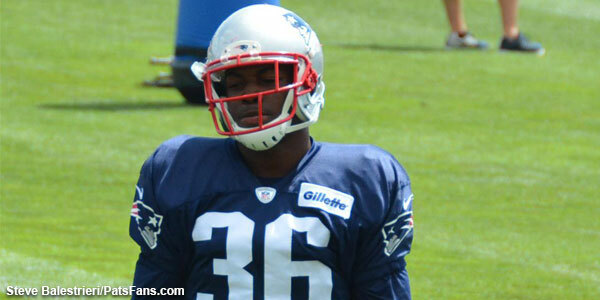 In certain packages, the team will move McCourty around and bring in Harmon to play centerfield. He played in nearly 54 percent of the team’s defensive snaps and allowed just 4 of 11 passes for 69 yards and two touchdowns in 2015. He was also credited with three passes defended and three interceptions. His 58.5 passer rating against, was the best of the Patriots’ secondary men. Richards was drafted in the 2nd round of the 2015 NFL Draft with the 64th overall pick. He has an outstanding football I.Q. and is a high character guy. As a rookie, most of his playing time (21% of the defensive snaps), came after McCourty and Chung suffered injuries late in the season. He’s best suited to the backup of Chung, being used down in the box and covering the tight ends. King was a pleasant surprise a year ago, carving out a special team’s role and ending up with the second most tackles on the STs unit. He wasn’t given much of a chance of sticking but worked closely with Special Team’s Coach Joe Judge and had a solid rookie season. Ebner was given a contract extension this spring and has been a valuable member of the STs unit. But he was granted a leave of absence to compete in the 2016 Summer Olympics as a member of the US National Men’s Rugby Team. He’s been a fixture here but his absence could open the door for another player who steps up in training camp. Kamu Grugier-Hill could be one of those players. An undersized, athletic demon on special teams, he could easily carve out a role for himself on defense as well. He’s one of those LB/S hybrids that teams are filling their rosters with. Sunseri is an intriguing player, someone I was hoping the Patriots would take a look at in 2014 when he was taken by the Saints in the NFL Draft. He’s the son of the Raiders’ coach Sal Sunseri and was lauded by his teammates at ‘Bama as being a coach on the field. An excellent special teams’ leader, he is also injury prone. He blew out an ACL in his senior season, had his rookie year cut short with a broken arm and missed all of 2015. This may be an audition of another kind. He may end up being a coach in the not too distant future, and maybe Belichick is building off of some first-hand knowledge of him. Vereen was signed to the Patriots practice squad in November after being released by the Bears and then the Vikings. After the season was over, he signed a future’s contract for 2016. 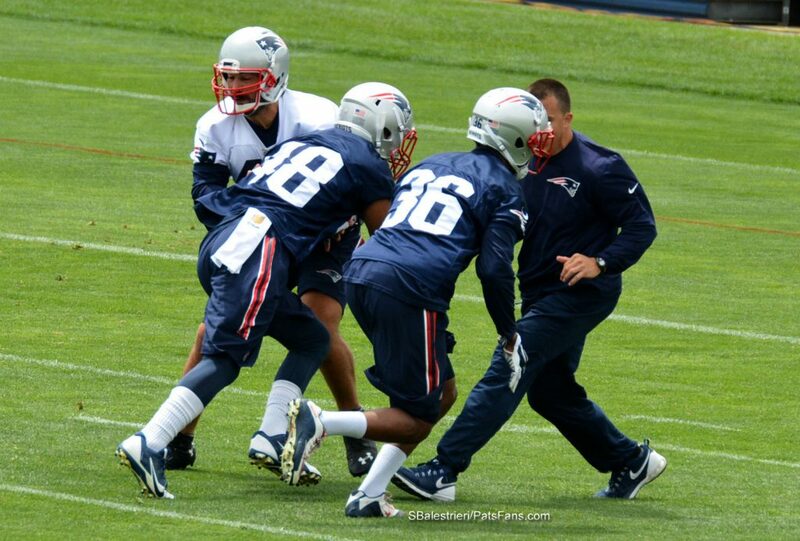 Vereen can play safety and has filled in at slot corner. He’s considered a core special teams’ player and served as a gunner for a bit this spring. He is a longshot to make the roster. Thompson spent all of 2015 on the Dolphins’ practice squad after being drafted by Miami in the 5th Round of the 2015 NFL Draft out of Minnesota. He wasn’t resigned and the Pats signed him to a future’s contract. The 6’0, 212-pound safety is another longshot to make the roster given the depth. Check out our earlier primers on the running backs, wide receivers, tight ends, offensive line, defensive line, linebackers and the cornerbacks. 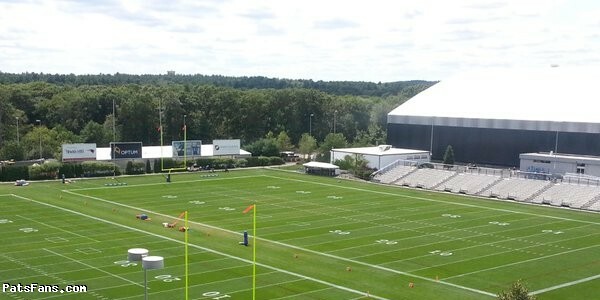 And be sure to keep tuned into PatsFans.com during training camp as we’ll post daily updates from down in Gillette. This entry was posted in Uncategorized and tagged 2015 NFL Season, 2016 NFL Combine, 2016 NFL Draft, 2016 Patriots Draft, 2016 Patriots Roster, 53 Man Roster Projection, Bill Belichick, Brandon King, Brock Vereen, Cedric Thompson, Devin McCourty, Duron Harmon, Jordan Richards, Nate Ebner, New England Patriots, NFL, Pat Chung, Patriots, Patriots safeties, Tom Brady, Vinnie Sunseri on July 26, 2016 by Steve Balestrieri. Good morning, here are Sunday’s Patriots news 7-24 and notes on what’s happening around the AFC East. 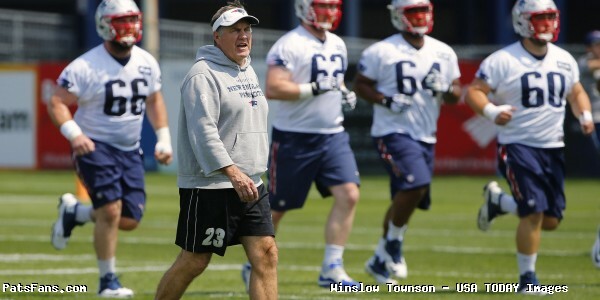 Be sure to keep checking PatsFans.com as training camp begins. We are doing primers by position and we’ve already posted ones on the running backs, tight ends, wide receivers, offensive line, defensive line and linebackers. Tomorrow we’ll get to the cornerbacks, followed by the safeties. The Patriots on Friday signed rookie free agent Kyler Kerbyson bringing the roster number to 88 which still leaves two open slots for the beginning of training camp. Kerbyson started 13 games in 2015 for Tennessee at left tackle and has played some guard as well. During the pre-draft process, he was projected more as a guard in the NFL. His signing may not bode well for the health of either Josh Kline or Tre’ Jackson who each missed the entire spring OTAs and minicamp. It will be interesting to see how the team fills the other two open roster slots. There is room for possibly a veteran running back or corner and depending upon the health of Shaq Mason, another offensive lineman. Mason missed all of the spring before appearing in the last workout of minicamp. With training camp opening this week, the summer vacation for the players is over and they will begin their work for the entire season with a brief respite during the bye week. But for the fans, and many will be planning vacation weeks around training camp dates, many questions remain. We’ll try to answer as many as possible. Practices and parking are free during training camp but as a word to the wise. Arrive early. Parking is in the P6 or P8 parking lots. It is a first come, first served operation and the crowds get bigger every year. With a pair of joint practices against the Saints and then the Bears before their respective preseason games, the crowds will probably be much, much larger. The veterans must report by July 27 the rookies report today. The first scheduled practice is July 28 and here is the tentative schedule. After every practice session, a certain amount of players will be made available for giving autographs and taking pictures with the fans. According to the Patriots site, no video cameras, GoPro cameras or drones are allowed. The schedule past August 1 hasn’t been released yet, but the joint practices with New Orleans are slated for August 9-10, and the Bears on August 15-16. On Wednesday afternoon before the Boston Red Sox took on the San Francisco Giants, Pats WR Julian Edelman took batting practice with the Sox. With many of the Sox on-hand to include skipper John Farrell, Edelman put on quite the show, blasting several homers over the Green Monster. Edelman who is becoming quite the social media presence these days looked to be having himself a great time. The better news is Edelman was planting his foot pretty solidly to get his bombs to fly over the “Monstah”. If there was still some concern over his foot, I doubt that this would have happened. 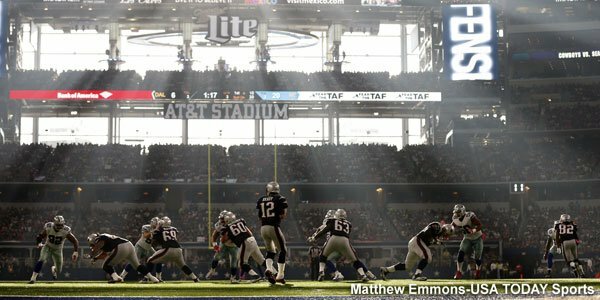 And since there never are any kind of coincidences with the Patriots and the fact that the RS just happened to have their photographer on hand. 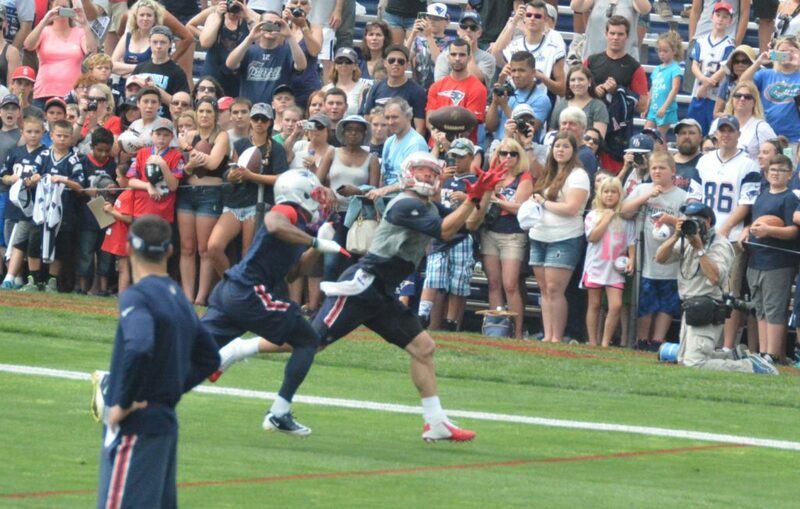 Maybe it was a subtle message that …yes Edelman will be ready for September 11. 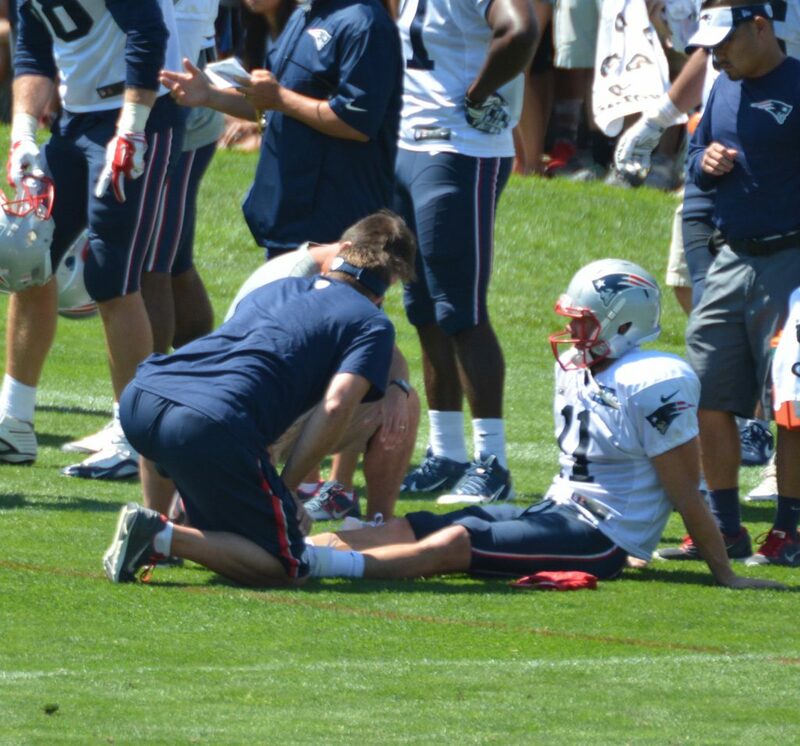 Speaking of social media butterflies, Pats TE Rob Gronkowski continues to be everywhere this summer. There are no off days during the “Summer of Gronk” tour. The big man’s latest escapades had him also at Fenway Park as he joined Beatles’ legend Paul McCartney onstage to try his hand at a little air guitar. He also joined Sir Paul in singing “Helter Skelter”. He then appeared with Seahawks QB Russell Wilson and his new bride Ciara on the Nickelodeon show, The Kids Choice Sports Awards. On Wednesday, he threw out the first pitch at Fenway, joining his buddy David Ortiz on the field. If that wasn’t enough Gronk, Malcolm Butler, and LeGarrette Blount appeared in Boston at Downtown Crossing on Friday and were dressed as Good Humor Men. They delighted fans by chatting, signing autographs and of course, handing out ice cream. And what better way to top it off than having Gronk break out into a dance and spiking an ice cream cone. The Miami Dolphins signed free agent running back Arian Foster this week. The move to bolster and push RB Jay Ajayi is one that could bear fruit for Miami this season. Foster is 30, the age when running backs start to break down and he’s already suffered thru some injuries in his seven-year career. But if healthy, Foster is a player that can catch the ball out of the backfield and is very good in pass protection, something Ajayi has struggled with. The team drafted Kenyan Drake in the 2016 NFL Draft and Ajayi has only 187 career rushing yards, so Foster could be that veteran presence that helps out the younger guys. There are some that believe that the Foster signing is showing the Fins don’t believe in Ajayi. They are pointing at the offer sheet to C.J. Anderson that Denver ultimately matched as proof that the coaches don’t trust him. This will bear watching as camp plays out. Arizona Cardinals QB had just three words for the New York Jets, embroiled in a contract dispute with QB Ryan Fitzpatrick. “Pay the Man”. Palmer and Fitzpatrick were golfing together in a celebrity tournament in Lake Tahoe when Palmer who is close to Fitzy, chimed in on the impasse. “He’s a good friend of mine, he’s an ex-teammate of mine, and I know what he means to a locker room. I know what he means on the field. The two sides have spoken since Fitzpatrick turned down a three-year, $24 million-dollar offer from the Jets this spring. NFL.com’s Ian Rappoport reported this week that talks between the Bills and CB Stephon Gillmore have stalled and it appears that he’ll play out the final year of his rookie contract. Buffalo picked up the fifth-year option on Gillmore’s rookie deal and he’s due a cool $11.082 million dollars in 2015. But Gillmore is looking for a long-term extension and wants to be paid among the top cornerbacks in the NFL. Gillmore has become an integral part of the Bills’ defense and is an excellent, complete cornerback. But the Bills, at least at this point are digging in their heels and hold the leverage. If Gillmore were to hold out the entire preseason, the fines and money lost would total nearly $3 million dollars according to Mike Rodak from ESPN. 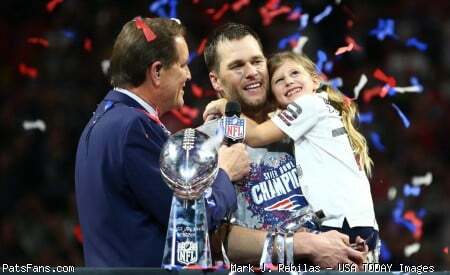 This entry was posted in Patriots Commentary, Patriots News and tagged 2015 NFL Season, 2016 NFL Draft, 2016 Patriots Roster, 53 Man Roster Projection, Bill Belichick, Buffalo Bills, Julian Edelman, LaGarrette Blount, Miami Dolphins, New England Patriots, New York Jets, NFL, Patriots, Patriots edge rushers, Rob Gronkowski, Tom Brady on July 24, 2016 by Steve Balestrieri. The Patriots head into training camp next week and there should be no shortage of competition at a number of spots. As a lead-in to the beginning of camp, we’ll break down the positions and give our take on who is a lock, a near lock for the 53-man roster and who is on the bubble. Next up are the Linebackers. So the next position to break down are the linebackers. The Patriots have two of the best LBs in the business with Jamie Collins and Dont’a Hightower. But they each missed time in 2015 and the depth behind them was a problem. The run defense really suffered when Hightower was injured in the Denver game in November. 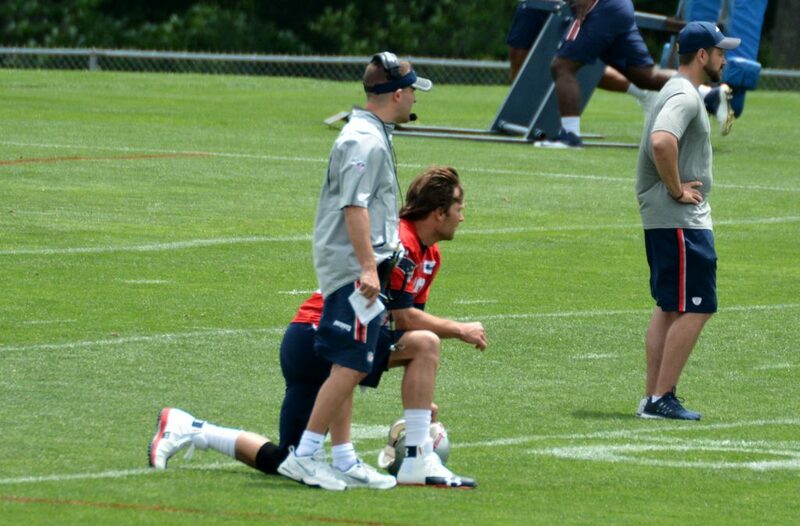 Both are free agents at the end of this season, something the Patriots should try to rectify this summer. Jonathan Freeny played some meaningful snaps on defense but struggled with his consistency. The team signed former Bears LB Shea McClellin this spring and the former first round pick gives them some versatility. He can play DE, OLB, and ILB. During the spring, McClellin was seen mostly at DE but I’d expect him to revert to linebacker once the pads come on. 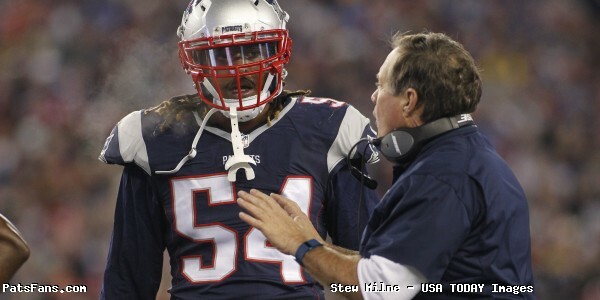 Collins and Hightower are a fantastic duo at linebacker. One of the reasons I don’t care for those Top 10 Lists or in this case the NFL’s Top 100 is how can Collins be left off of that? The freakishly athletic 6’3, 250-pound linebacker led the team in tackles with 89, had 5.5 sacks and forced five fumbles despite playing in only 12 games. He missed four games due to an illness. He’s also outstanding in coverage and can make plays all over the field. Pro Football Focus (PFF), had Collins rated as the AFC’s top linebacker in 2015. While Collins and for that matter Hightower didn’t make the Top 100 player list, should they hit free agency they’ll get paid like one. Hightower is the perfect complement to Collins. Big at 6’3, 265-pounds, he is a fantastic run stuffer in the box with his size and instinctive play. Smart, he calls the plays for the defense and ensures everyone is lined correctly pre-snap. He logged 61 tackles and 3.5 sacks in 12 games last season. Hightower is the glue that holds the front seven together and provides the solid run protection while Collins is the athletic playmaker. McClellin came over from the Bears during free agency and the biggest question about his signing is, where will he fit? New England was interested in him during the draft process in 2012 but the Bears selected him in the first round with the 19th overall pick. Chicago initially had him as a sub-package edge rusher, a full-time defensive end, then two years ago they moved to linebacker where he lined up outside and then in the Mike position. While the Patriots worked him as a defensive end during the spring, look for him to revert to his best fit and that would be as a linebacker. McClellin will initially back up Collins and Hightower and go on the field when they play their base defense. Freeny came over from the Dolphins a year ago with the reputation as a solid special team performer. He did that but was pressed into service much more on defense after both Collins and Hightower were lost for periods of time during the year. He logged the third most snaps at linebacker for the Patriots behind Collins and Hightower and notched 50 tackles, one sack, two QB pressures, one forced fumble and two fumble recoveries. But although he was serviceable against the run, Freeny struggled in coverage, allowing 19 of 21 passes to be completed. That must improve. Johnson made the team out of training camp in 2015 only to end up on IR with an illness in October. The 6’5, the 280-pound backer is athletic and turned heads as a pass rusher in camp. His size and versatility (he can also play DE), may give him a leg up on Freeny if it comes down to a numbers crunch. With defenses around the NFL getting smaller and more athletic, a player’s versatility can sometimes mean a world of difference between a roster spot and that dreaded call from the “Turk”. That’s where Kamu Grugier-Hill comes in. He is built like a safety, can run like a slot corner and plays linebacker. The 6’2, 215-pound hybrid S/LB was drafted in the 6th round of this year’s draft with the 208th overall pick. He’s certainly athletic; he ran a 4.45 in the 40-yard dash with a 1.52 10-yard split. Coupled with a 6 .89-second time in the 3-Cone Drill, a 38.5-inch vertical leap, and a 10-foot, 9-inch broad jump, he’s intriguing, to say the least. He was getting a lot of 1-on-1 work with Special Teams Coach Joe Judge this spring and he should fit well in a gunner role as well as a punt blocker. But he could also see some time as hybrid “money” LB/S role that Pat Chung plays as well. 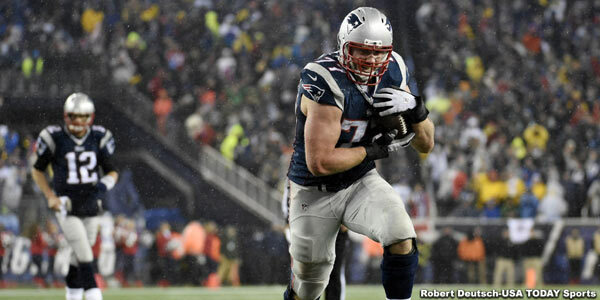 Humber was the first player signed by the Patriots during free agency on March 9. He’s a standout special teams’ performer but with a limited ceiling on defense. He did have 13 starts at middle linebacker in the past three years as an injury replacement. Originally signed in 2009 by the Colts as a UDFA out of North Dakota State, Humber moved over to the Saints in 2010 and played there until being released this spring. He may find himself pushed hard by Grugier-Hill. Snyder was signed to the Patriots practice squad in December after being released by the Lions who signed him as a rookie free agent in May. He was active for but didn’t play in the AFC Championship Game in Denver. The 6’2, 240-pound Snyder is a Rutgers product and also has good athleticism, running a 4.54 time in the 40, with a 35-inch vertical leap at his school’s Pro Day. Roberts was another 6th round draft pick by the Patriots and like Grugier-Hill is undersized at 6’0, 235 pounds. But he’s very productive and plays a down-hill style, run thumping Mike linebacker that belies his lack of size. He shows a tremendous explosion in the running game and when blitzing but struggles in pass coverage. C.J. Johnson is a 6’2, 235-pound rookie linebacker from Mississippi. He’s had injury concerns while in college and was moved from defensive end to middle linebacker in his senior season. His work ethic and attitude were lauded by the coaches and he was elected to be a team captain. However, he’ll face a steep uphill climb to make the roster. Check out our earlier primers on the running backs, wide receivers, tight ends, offensive line and the defensive line. 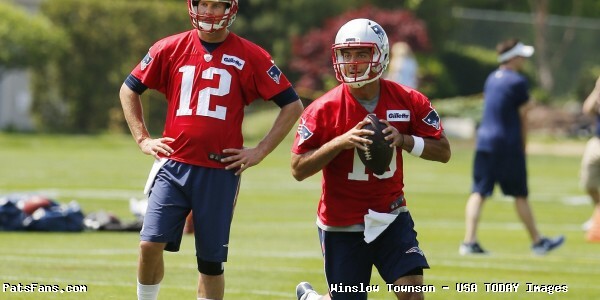 And be sure to keep tuned into PatsFans.com during training camp as we’ll post daily updates from down in Gillette. This entry was posted in Patriots Commentary, Patriots News and tagged 2015 NFL Season, 2015 Patriots Season, 2016 NFL Draft, 2016 Patriots Draft, 2016 Patriots Roster, 53 Man Roster Projection, Bill Belichick, C.J. Johnson, Dont'a Hightower, Elandon Roberts, Jamie Collins, Jonathan Freeny, Kamu Grugier-Hil, Kevin Snyder, New England Patriots, NFL, Patriots, Patriots edge rushers, Patriots linebackers, Ramon Humber, Rob Ninkovich, Rufus Johnson, Shea McClellin on July 22, 2016 by Steve Balestrieri. The Patriots head into training camp in just a few weeks and there should be no shortage of competition at a number of spots. As a lead-in to the beginning of camp, we’ll break down the positions and give our take on who is a lock, a near lock for the 53-man roster and who is on the bubble. Next up is the Tight End position. So next up are the tight ends. 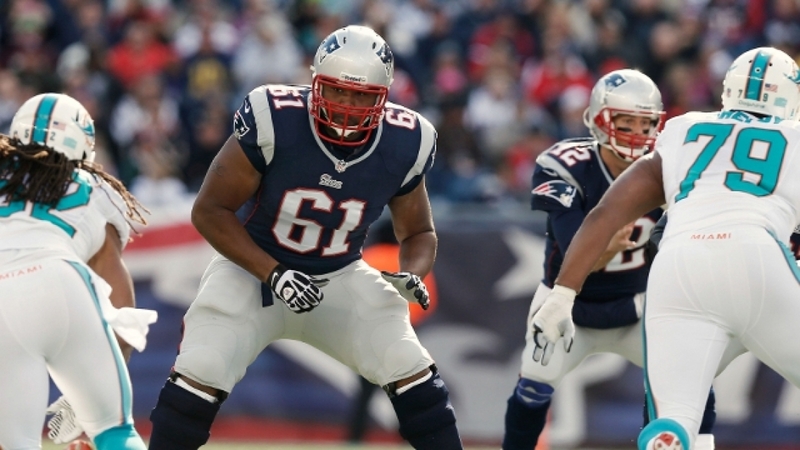 The Patriots have six players vying for roster spots. This position, (like the wide receivers) is one top heavy with roster locks and it will essentially come down to four players competing for one, maybe two roster spots. The question comes down to this: Do the Patriots keep just three tight ends or four? Well Duh! No brainer here. Gronk is the gold standard among tight ends in the NFL. No one possesses the type of athleticism at the position where he can attack the field down the seams, move the chains, and be a huge physical target in the red zone. Oh and he’s an outstanding blocker in the running game. Gronkowski is one of Tom Brady’s favorite two targets, along with Julian Edelman. He relies on both a great deal and Gronkowski gives him a tremendous target that can be used in any part of the game plan. He enters the season healthy and is poised to have a big, big year. Bennett is a perfect Robin to Gronkowski’s Batman. Another huge target at 6’6, 273 pounds, he’s a big body who can threaten the seams down the field. He’s also another tremendous blocker who can help out in the running game. Just two seasons ago Bennett caught 90 passes while a member of the Bears. He and Gronkowski are going to be a nightmare matchup for opposing defensive coordinators. The Patriots will most certainly use a lot of “12 personnel” in 2016 and with the suspension on Brady being upheld in federal court, the two tight ends become even more important in the Patriots offense during the first four weeks. One can argue that the acquisition of Bennett was specifically targeted for just this scenario. He will probably be here for just one year and his presence along with Gronkowski makes for a much more potent offense. But with Brady facing a month-long suspension, this move could have been made with Jimmy Garoppolo in mind. Garoppolo will face a daunting task of replacing Brady for the first month of the season but having Gronk and Bennett will go a long way of making the transition smooth. The package of plays using the tight ends will be a much quicker, easier read for Jimmy G and they along with Edelman will give him a very nice trio of weapons to work with. Not to mention that both will help the team run the football much more effectively this season. The Patriots usually like their third tight end to be more of a blocker. And Michael Williams was just that for the team. But unfortunately, Williams tore his ACL during the minicamp during June and was lost for the season. Neither Harbor, Bryce Williams, nor Derby fits that bill. But with both Gronk and Bennett being the blockers they are, perhaps the team will change things up, for 2016 anyway. And of course with the return of FB James Develin the Patriots have used him at times as an H-Back or blocking TE. Harbor was signed as a free agent this spring and was given a modest contract with the only guaranteed money is his signing bonus of $400,000. His cap hit is just under $1.3 million dollars with a base salary of $900,000. Harbor isn’t an in-line tight but more of a “move” tight end who can play H-back and occasionally fill in at fullback. During the 2013-2014 seasons, he was solid as the Jags’ #2 tight end and caught 51 passes for 581 yards and three scores. But last year he was replaced by former Bronco Julius Thomas and caught just 14 passes. His most productive day was against the Patriots in Week 3 where he caught three passes for 43 yards and a touchdown. Bill Belichick raved about his versatility before the Week 3 contest, setting the tone for the eventual free agent signing this spring. The third tight end position is his to lose. Williams is a big (6’6, 258 lbs), move tight end that converted from a fullback at ECU that the team signed as a UDFA this spring. With his size, one would assume he’d be more of an in-line tight end. But he’s more of a finesse blocker than a mauler like Gronk or Bennett. He was productive as a senior catching 58 passes for 588 yards and four touchdowns. He still needs polish on his route running skills but has the straight-line speed to attack the seams. He’s got good athletic skills, running the 40-yard dash in 4.94 seconds and the three-cone drill in 7.19 seconds at the NFL Combine. 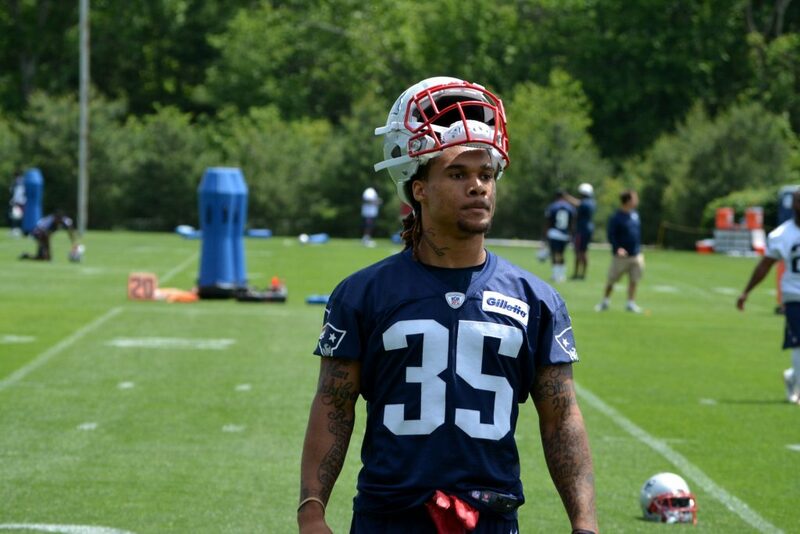 Derby was drafted by the Patriots in the 6th round of the 2015 NFL Draft and was placed on IR in early August, just days after training camp started. The 6’5, 255-pound former QB, and LB is another “move” tight end who is facing an uphill climb to make the roster. He played only one season at TE in college so his route running was in need of polish and he wasn’t the greatest blocker, but he has upside as well. Ran a 4.69 in the 40-yard dash at his Pro Day and showed a willingness to run the tough routes over the middle. Scheu was a three-year starter at Vanderbilt who suffered from poor QB play that limited his production. He finished his senior season with just 26 catches for 231 yards in 2015. Scheu (pronounced SHOY), is a 6’4, 245-pound move tight end that has soft hands and runs good routes as a receiver. His issue is speed or the lack of it. Coming out in the draft this season, he was known as a plodder and doesn’t have the burst to attack the seams. It will be difficult for him to gain separation in the intermediate routes. He isn’t a good blocker in the running game. But as a short range target that can help in the short passing game, he could find a niche. This entry was posted in Patriots Commentary, Patriots News and tagged 2016 NFL Combine, 2016 NFL Draft, 2016 Patriots Draft, 2016 Patriots Roster, 53 Man Roster Projection, A.J. 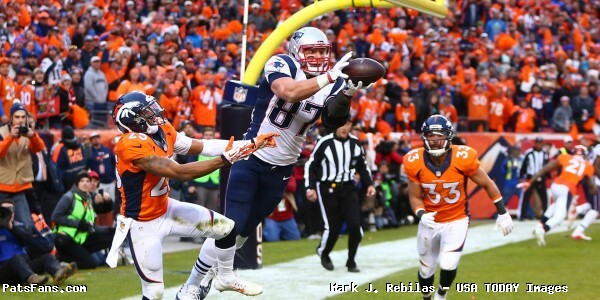 Derby, Bill Belichick, Bryce Williams, Clay Harbor, Julian Edelman, Martellus Bennett, Michael Williams, New England Patriots, NFL, Patriots, Patriots tight ends, Rob Gronkowski, Steven Scheu, Tom Brady on July 15, 2016 by Steve Balestrieri. The Patriots head into training camp in just a few weeks and there should be no shortage of competition at a number of spots. As a lead-in to the beginning of camp, we’ll break down the positions and give our take on who is a lock, a near lock for the 53-man roster and who is on the bubble. Next up is the Wide Receiver position. So next up are the wide receivers. The Patriots have no less than 11 players vying for roster spots although Matthew Slater is truly a special teams’ specialist first and a WR second. For our purposes, we’ll list Slater later with our STs primer. This is a position that is top heavy with roster locks and it will be hard for some of the players trying to either break into the NFL or established veterans to carve out a roster spot. So the competition here, especially for the last slot will be intense. Another question to be answered is, will the Patriots carry five WRs or six? Edelman is recovering from another procedure related to his surgery where he had another pin placed in his broken foot. That the team will no doubt opt to go slowly with him will help the other players vying for spots get more reps. Among the cognoscenti of national NFL writers, Edelman is widely considered a “system player”. While we differ with that assessment, no one can argue his worth with Tom Brady and the Pats. He’s one of Brady’s favorite two targets in the passing game and his toughness and willingness to do the dirty work is unquestioned. 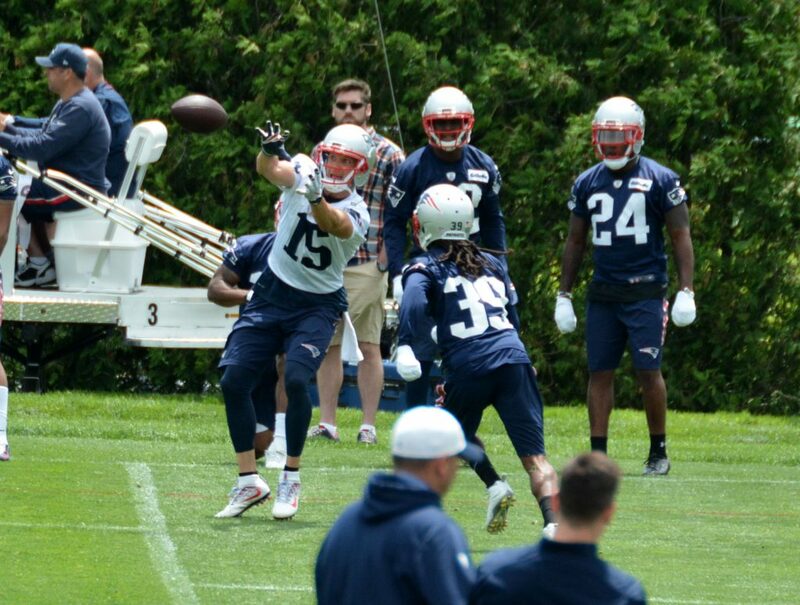 A healthy Edelman in September means big things for this offense, so we may not see much of him in camp. 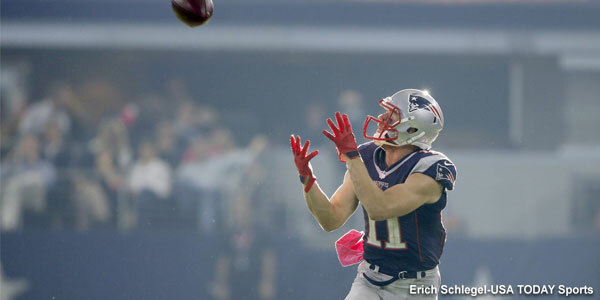 Amendola has worked himself in Brady’s “Circle of Trust” and become a key member of the wide receiver core. He has a knack for making the tough catches at critical times and is another guy who, while not the biggest guy, has plenty of toughness. He worked his contract again to stay in NE. Hogan was signed as a free agent from the Buffalo Bills this spring and is another guy that isn’t highly valued elsewhere. But he’s a perfect fit for this New England offense. He can play inside in the slot or slide outside into the “X” position that Brandon LaFell played in the past two seasons. 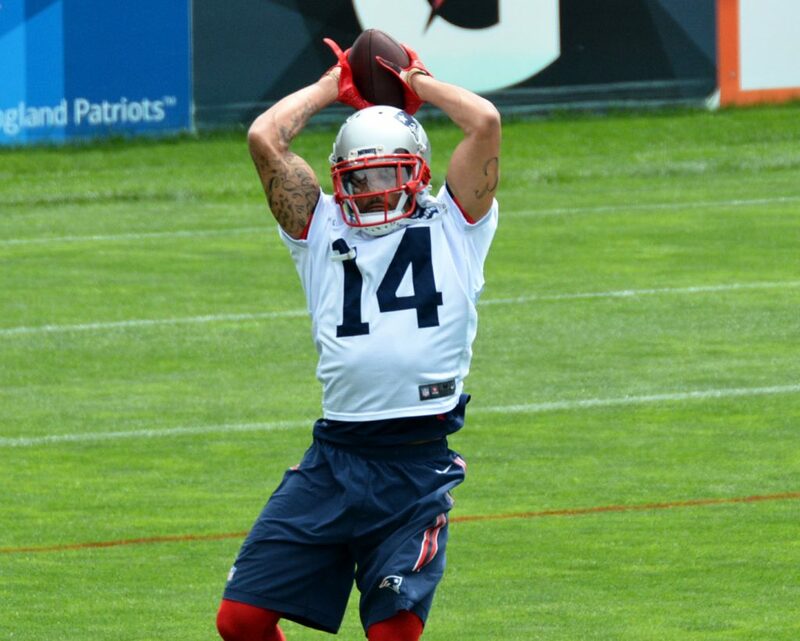 While he doesn’t have the short-area quickness of Edelman, he’s bigger (6’1, 220 lbs) with better top end speed. He’ll be an intriguing guy to watch as the season unfolds. Mitchell is a lock due to his draft position. The rookie wide receiver from Georgia has decent size at 6’1, 195 pounds and played in a pro-style offense in college. He runs good crisp routes, has excellent hands and has outstanding athleticism. He probably would’ve gone higher in the draft but he had some injuries and played in a run-heavy offense. Mitchell injects some much-needed youth into the wide receiver position. Martin came over in a trade last year with the Houston Texans and showed he was a quick study, learning the Patriots offense swiftly upon his arrival. Now with a full offseason under his belt, Martin is looking to carve out a role with the team. The speedy, if undersized wide receiver has the versatility that the coaches love. He can play inside in the slot (are we seeing a pattern here? ), outside in the “X”, as well as play special teams. Martin was given a contract extension with some decent guaranteed money last year, so the team liked what they saw from him a year ago. Washington, another Texans’ WR, signed with the Patriots as a free agent in March. The 32-year old veteran was a member of two Super Bowl winning teams earlier in his career and now is looking to add another to his resume. He’ll be an outside the numbers kind of receiver here. Washington has always been a deep threat kind of player with a 15.2-yard career average per reception. How will he fit in with the Patriots short to medium passing game? He struggled to find a rhythm with Brady in the spring, but there is plenty of time left to get it going. The clock is running out for Aaron Dobson. When the Patriots drafted him in 2013 NFL Draft he came with a rep of having the size and hands to be a #1 type receiver for the Patriots. But injuries, inconsistent play and a lack of confidence in him place him squarely on the bubble in 2016. He had a strong spring, but will need much more to stick around this year. He’ll have to stay on the field for the entire training camp and preseason and turn some heads. Chris Harper signed with the Patriots as a UDFA out of Cal last spring. Facing an uphill battle in training camp, he had an impressive summer and preseason and made the 53-man roster in September. But he couldn’t break into the offense last season and unfortunately for him, he’s best remembered by the gaffe he made. He muffed a punt in Denver last November which led to a Denver comeback OT victory. Harper faces much the same odds this season again and will need a strong summer to make the team. While these next two players are longshots, don’t go to sleep on either. Devin Lucien is an intriguing player because he’s bigger receiver at 6’2 and is the kind of guy who traditionally comes out of nowhere to make the team. He played three seasons at UCLA and had just 58 catches before transferring for his senior season at Arizona State. Playing in the “X” role, he had a solid 2015 with 66 catches for 1072 yards and eight touchdowns. But it was his finish that got the Patriots attention. 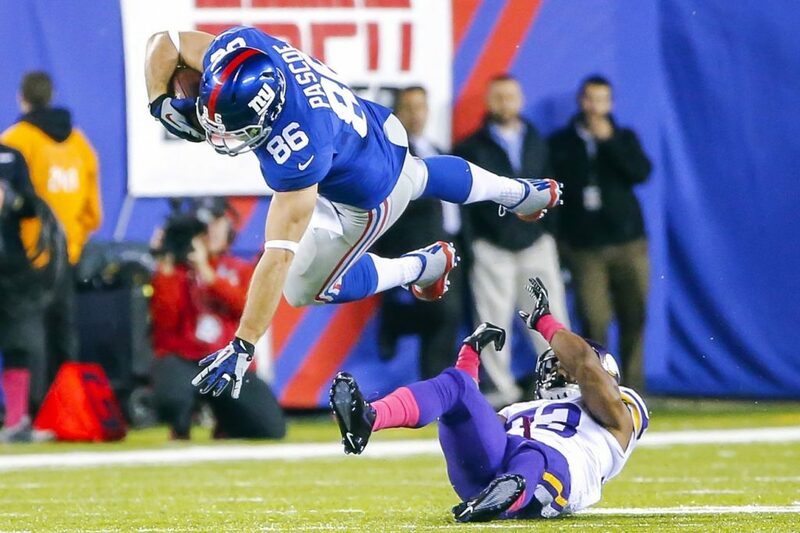 He snagged 26 catches for 534 yards with five touchdowns in his final three games. Once he got familiar with the offense, his play took off. He was one of Pro Football Focus’ UDFA sleepers to watch. He’s got very good athleticism, running a 4.49-second 40-yard dash at his Pro Day with a 6.93 time in the 3-cone drill and a 34.5-inch vertical leap. With the logjam ahead of him at WR, it will be a tough hill to climb for the 7th rounder, but we’ve seen this happen before. He may be a good Practice Squad candidate. DeAndre Carter signed with the Ravens as a UDFA in the spring of 2015. He spent training camp with Baltimore before being picked up by Oakland and finally the Patriots last year. 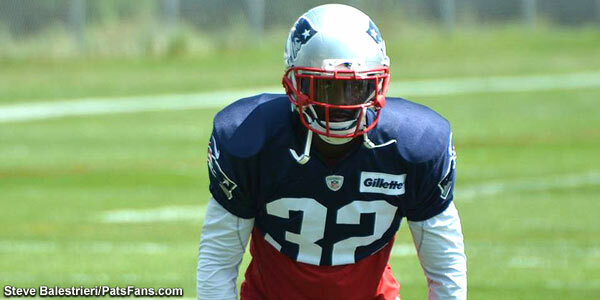 He signed a futures contract with New England and is facing an uphill climb to make the roster. While diminutive at just 5’8, 188 pounds, Carter is very athletic, running a 4.44 time in the 40-yard dash with a 1.45 10-yard split, a 38.5-inch vertical leap and a very impressive 6.64 time in the 3 Cone Drill. Carter is fast, makes quick cuts and had a pretty impressive spring. But again, with the logjam at WR especially players that can play the slot, he’ll have to really have an impressive summer to stick. But if Edelman and Amendola aren’t ready to go at the outset of training camp, Carter could turn enough heads to make a push for a roster spot. He too, like Lucien could end up on the Practice Squad this fall. 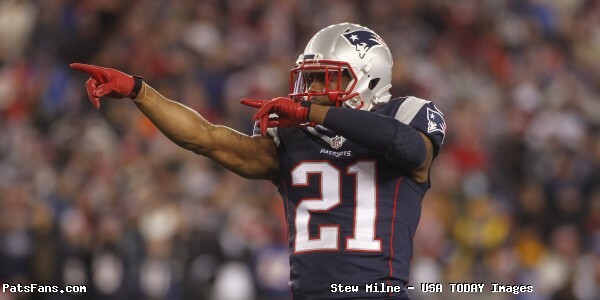 This entry was posted in Patriots Commentary, Patriots News and tagged 2016 NFL Draft, 2016 Patriots Roster, 53 Man Roster Projection, Aaron Dobson, Bill Belichick, Brandon LaFell, Chris Harper, Chris Hogan, Danny Amendola, DeAndre Carter, Devin Lucien, Julian Edelman, Keshawn Martin, Malcolm Mitchell, Matthew Slater, Nate Washington, New England Patriots, NFL, Patriots wide receivers, Tom Brady on July 13, 2016 by Steve Balestrieri.